Hermia and Lysander loved each other. But Hermia’s father wanted Hermia to marry another man named Demetrius. In Athens, where they lived, there was a terrible law. What it said was that any girl who refused to marry according to her father’s wishes could be killed. 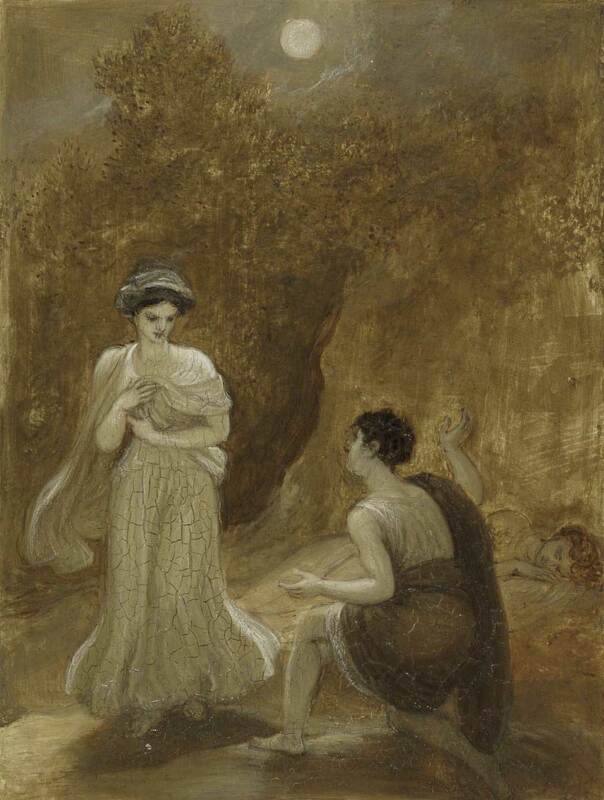 Hermia’s father was so angry with her for refusing to do as he wished, that he actually brought her before the Duke of Athens to ask if she could be killed, if she still refused to obey him. The Duke gave Hermia four days to think about it, and, at the end of that time, if she still refused to marry Demetrius, she would have to die. Lysander of course was nearly mad with grief. The best idea he could come up with was to tell Hermia to run away to his aunt’s house, which was far away, and where the cruel law did not apply. Then, he thought, he could come and marry her. But before they could begin their plan, Hermia told her friend Helena what she was going to do. Helena had loved Demetrius long before Hermia’s father had begin to force him to marry Hermia, and like all jealous people, Helena could not see that it was not poor Hermia’s fault that Demetrius was going to marry her. 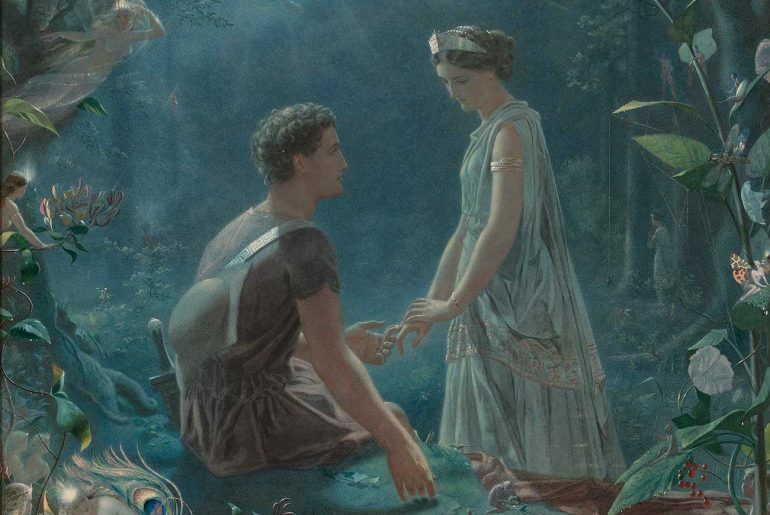 Helena knew that if she told Demetrius that Hermia was going to the wood outside Athens to escape the marriage, he would follow her, “and I can follow him, and at least I shall see him,” she said to herself. So she went and told him, betraying her friend’s secret. 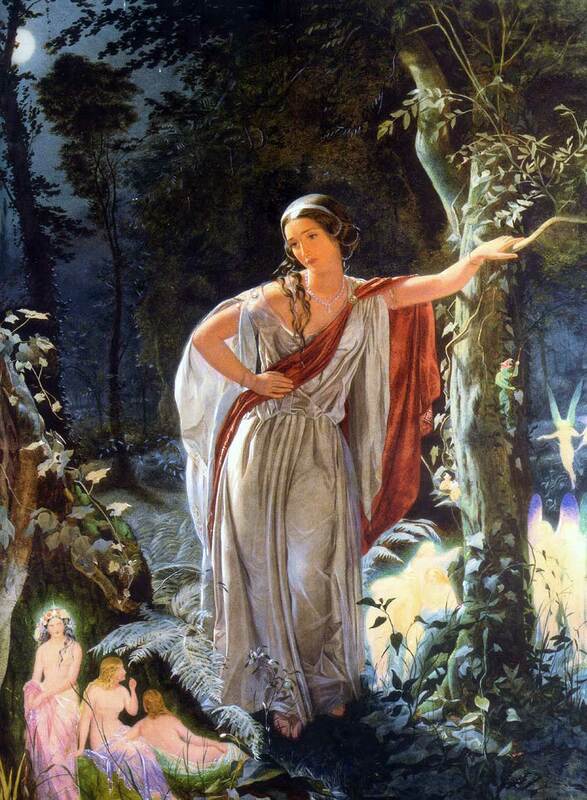 Now the place where Lysander was planning to meet Hermia, and where the other two had decided to follow them, was a wood full of fairies. 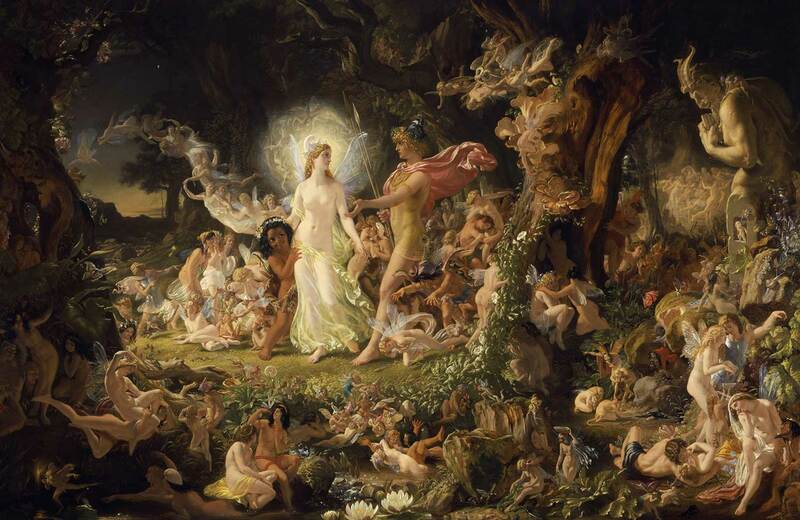 In the wood on this night were the King and Queen of the fairies, Oberon and Titania. 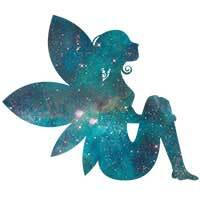 Fairies are usually very wise people, but every now and then they can be quite as foolish as mortal folk. Oberon and Titania, who might have been as happy as the days were long, had thrown away all their joy in a foolish quarrel. They never met without saying horrible things to each other, and yelled at each other so dreadfully that all their little fairy followers, for fear, would creep into acorn cups and hide them there. And this night, the King and Queen of the fairies were fighting over a little Indian boy that they both loved. 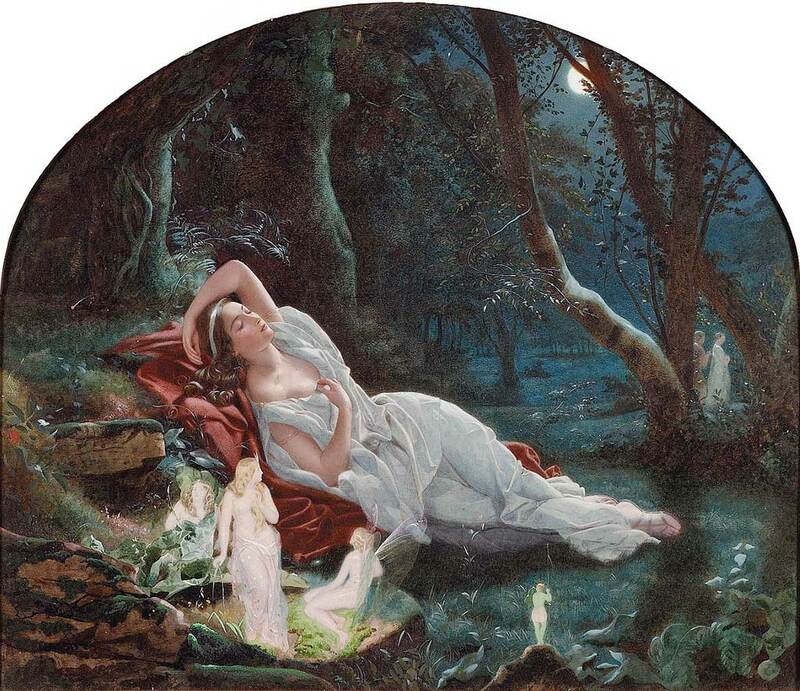 Oberon wanted the boy to be one of his fairy knights, and Titania wanted him to stay with her. 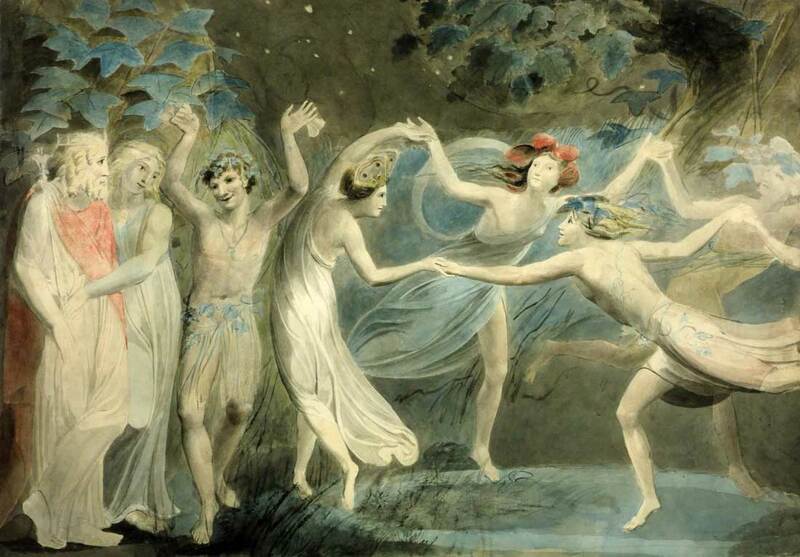 So, instead of keeping a happy court and dancing all night through in the moonlight, as fairies usually like to do, the King and his attendants wandered through one part of the wood, while the Queen with hers wandered through another, both of them trying to be the first one to find the little Indian boy, who had run away. 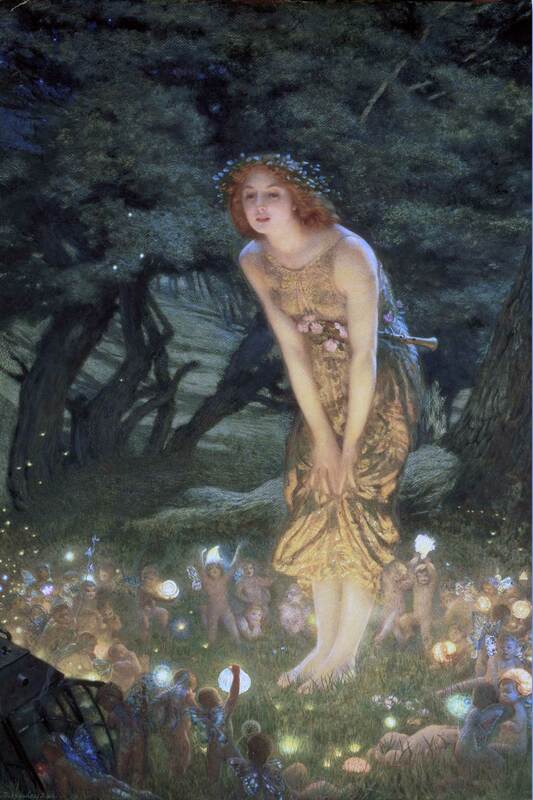 Oberon, wanting to be the one to find the little boy first, called his favorite fairy, Puck. Puck was the spirit of mischief. He used to slip into the dairies and take the cream away, and get into the churn so that the butter would not come, and turn the beer sour, and lead people out of their way on dark nights and then laugh at them, and tumble people’s stools from under them when they were going to sit down, and upset their hot tea over their chins when they were going to drink. While Puck was gone, Demetrius passed through the glade followed by poor Helena, and still she told him how she loved him and reminded him of all his promises, and still he told her that he did not and could not love her, and that his promises were nothing. 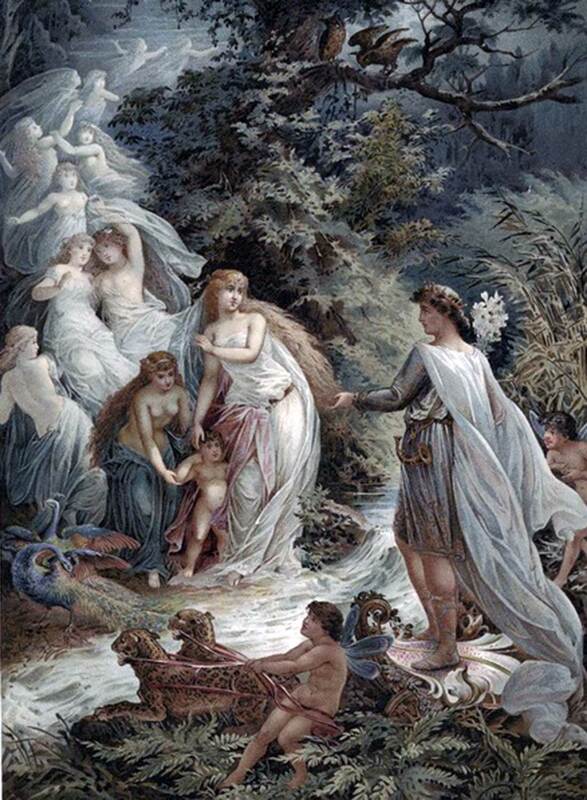 As it was in his part of the forest, Oberon saw what was going on between Helena and Demetrius, and felt sorry for poor Helena. So when Puck returned with the flower, he told him to follow Demetrius and put some of the juice on his eyes, so that he might love Helena when he woke and looked on her, as much as she loved him. So Puck set off, and wandering through the wood found, not Demetrius, but Lysander, on whose eyes he put the juice; but when Lysander woke, he saw not his own Hermia, but Helena, who was walking through the wood looking for the cruel Demetrius; and directly he saw her he loved her and left his own lady, under the spell of the purple flower. 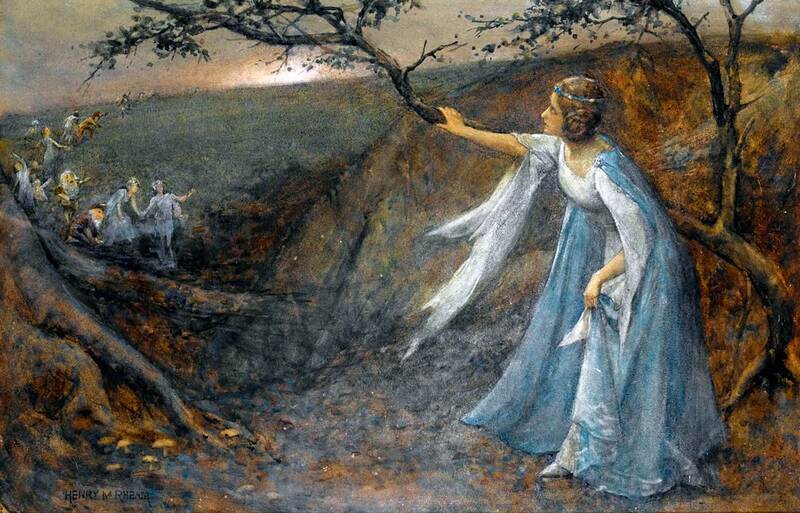 When Hermia woke she found Lysander gone, and wandered about the wood trying to find him. 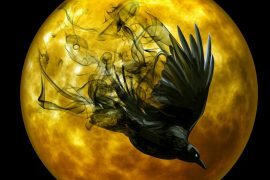 Puck went back and told Oberon what he had done, and Oberon soon found that he had made a mistake, and set about looking for Demetrius. 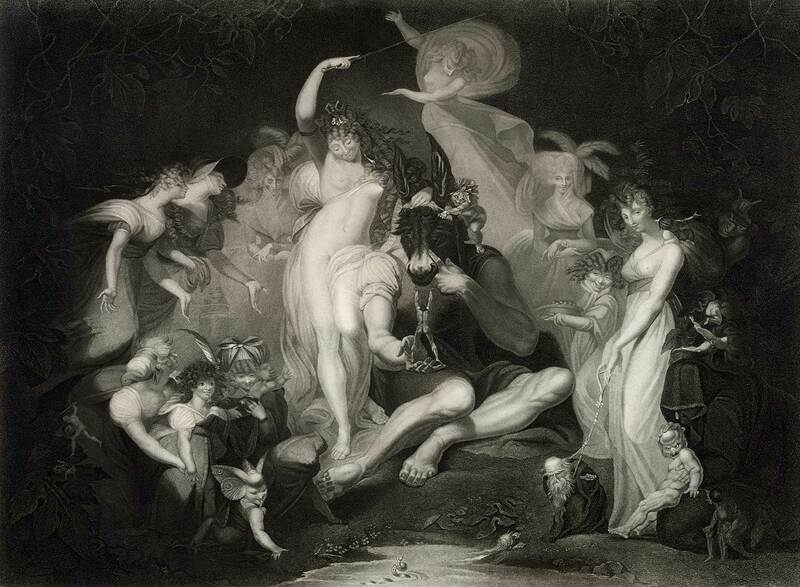 When Oberon found him, he put some of the juice on his eyes. And the first thing Demetrius saw when he woke was also Helena. So now Demetrius and Lysander were both following her through the wood, and it was Hermia’s turn to follow her lover as Helena had done before. So Demetrius and Lysander went off to fight each other instead. In the sight of your former love’s eye. Jack shall have Jill, and none will be ill. Think it, your true love make. “If I am wise enough to find my way out of this wood, that’s enough for me,” said the foolish clown, whose name was Bottom. So she called four fairies, whose names were Peaseblossom, Cobweb, Moth, and Mustardseed. “I will,” said all of the fairies together. 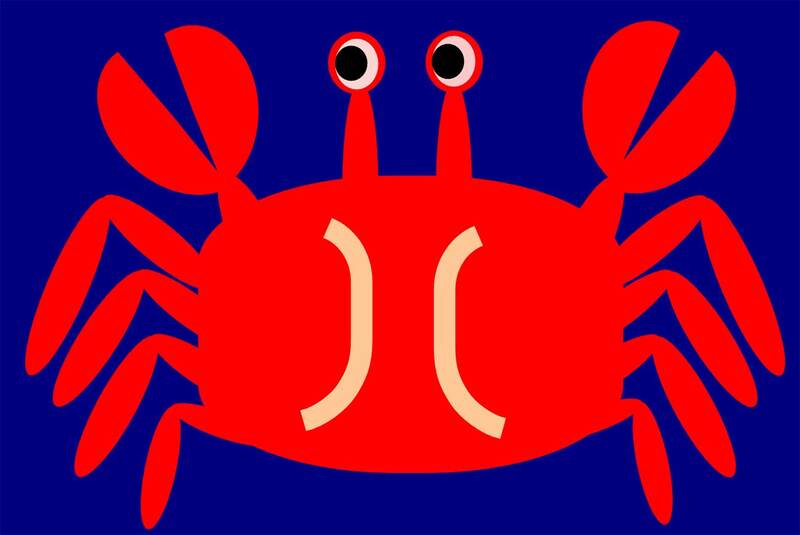 “Where’s Peaseblossom?” asked Bottom. He did not care much about the Queen’s affection, but he was very proud of having fairies to wait on him. “Would you like anything to eat?” said the fairy Queen. “Shall some of my fairies fetch you new nuts from the squirrel’s house?” asked the Queen. 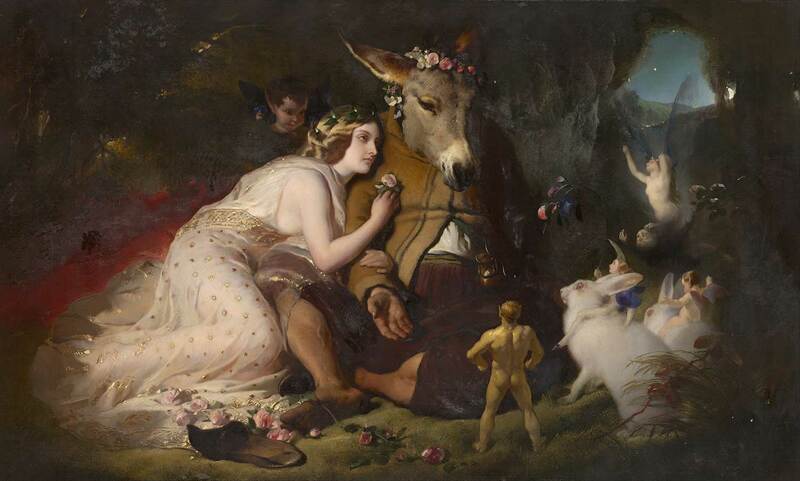 And so when Oberon came along he found his beautiful Queen lavishing kisses and endearments on a clown with a donkey’s head. And before he released her from the enchantment, he persuaded her to give him the little Indian boy he so much desired to have. Then he took pity on her, and threw some juice of the disenchanting flower on her pretty eyes; and then in a moment she saw plainly the donkey-headed clown she had been loving, and knew how foolish she had been. Oberon took off the donkey’s head from Bottom, and left him to finish his sleep with his own silly head lying on the thyme and violets. Thus all was made plain and straight again. 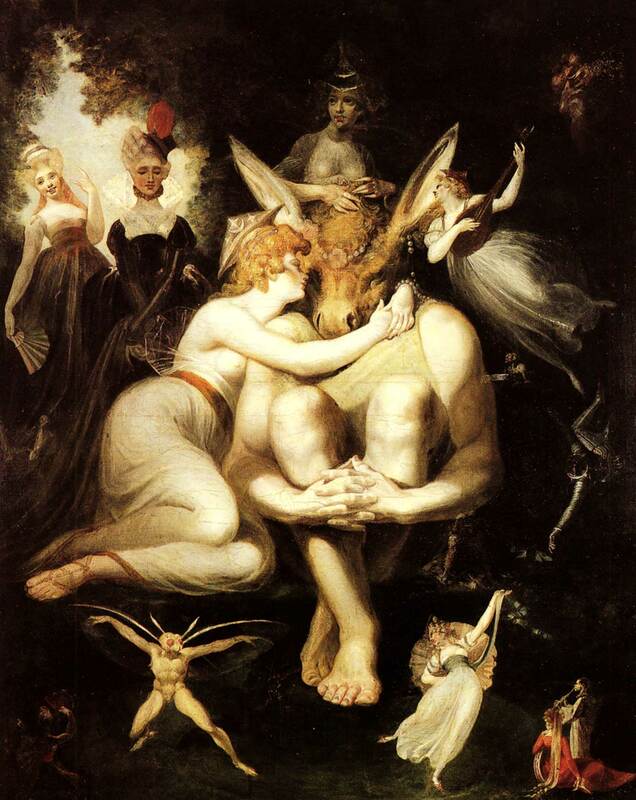 Oberon and Titania loved each other more than ever. Demetrius thought of no one but Helena, and Helena had never had any thought of anyone but Demetrius. 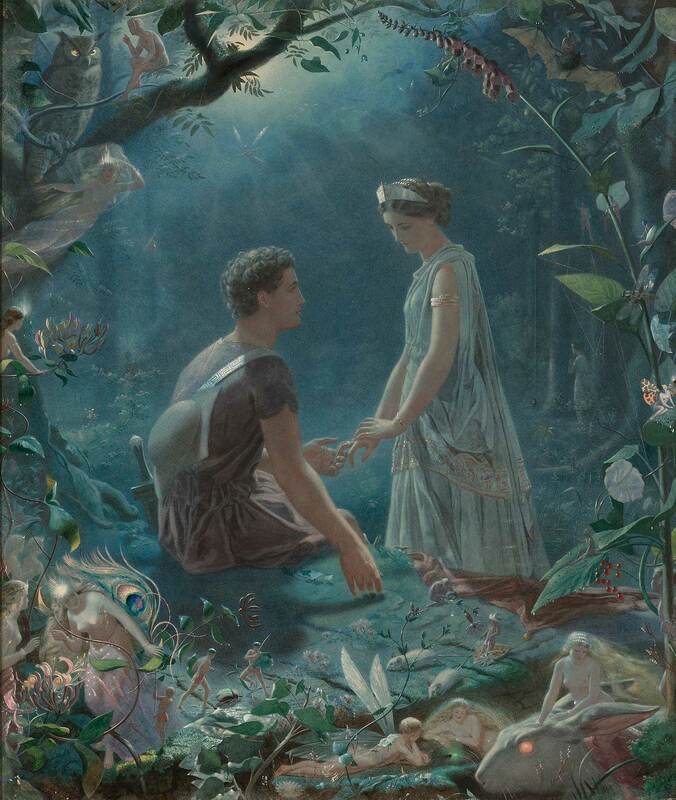 As for Hermia and Lysander, they were as loving a couple as you could meet in a day’s march, even through a fairy wood. Because Demetrius did not want to marry Hermia any longer, the Duke of Athens would not force Hermia to marry him. And so all four mortal lovers went back to Athens and were able to be married to the people they wanted. And the fairy King and Queen still live happily together in that very wood to this very day. 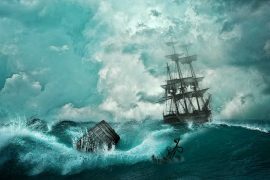 Written by William Shakespeare and Edith Nesbit, and updated by Jade Maitre. 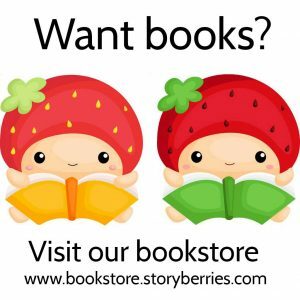 Illustrations by various artists in the Public Domain. 1. What do you think of the law of Athens where a daughter was obliged to marry the person her father wanted? Do you think this was a fair law? Why or why not? 1. Titania falls in love with Bottom. How does she show him her love? Do you think people who love each other always show it like this? 2. How about Hermia and Lysander, Demetrius and Helena? When they fall under Puck’s spell and love each other, how do they show this love? Do you think it’s true love? Why or why not?